Have you been following our Peep Experiments? Have you tried any of them? Or maybe some of your own? Peeps will never be the same for me again! After our Baking Soda & Vinegar Peeps Experiment I got curious about what it would take to actually dissolve one of these resilient little Peeps. I had the Lil Divas brainstorm which liquids they wanted to "test" that might be able to dissolve (or break apart) the Peeps. 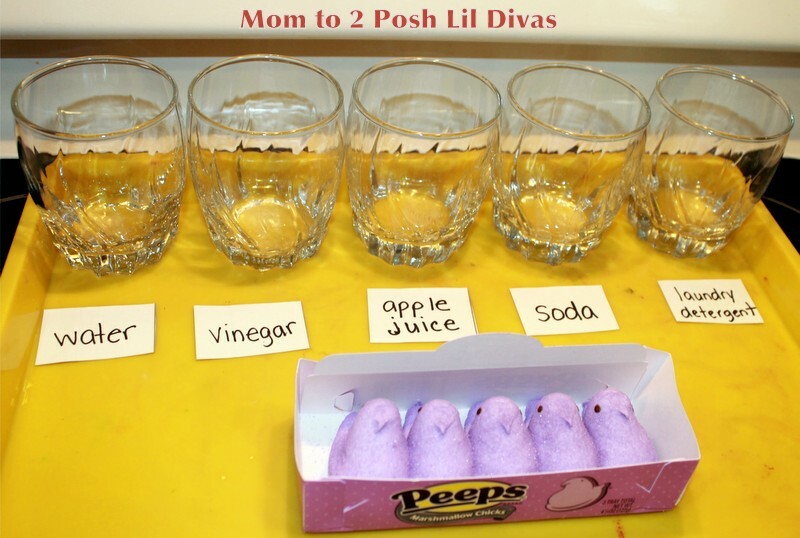 We used clear glasses so we could easily observe & photograph any changes in the Peeps. We added 1 Peep to each cup and filled it with one of the 5 liquids/solvents mentioned above. After approx. 3 hrs we saw a few changes, mostly in the coloring of the Peeps. All but the one in water had changed coloring somewhat. 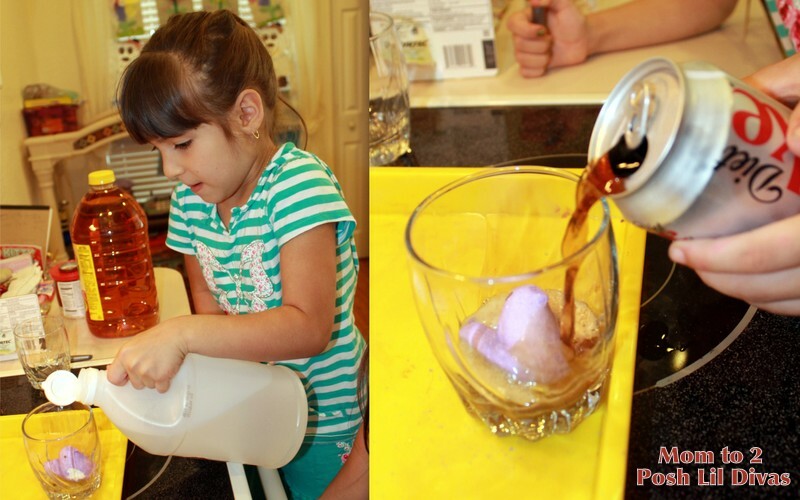 The most noticeable change was in the soda. The Lil Divas were grossed out by how it looked so brown. Perfect opportunity to remind them how bad soda is for them! After approx. 16 hrs. the Peeps were still intact minus some more color change. The Peeps in the vinegar and laundry detergent were a light blue color. The one in the apple sauce was turning pink and the one in the soda was a yucky brown. 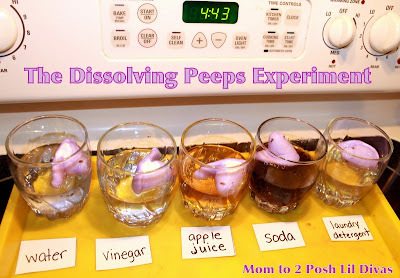 Day 2 - We started to see signs of the Peeps actually dissolving in the vinegar! The Peep in water looked the most intact (see how healthy water is for you!). The Peep in laundry detergent was almost completely white but it was still intact. 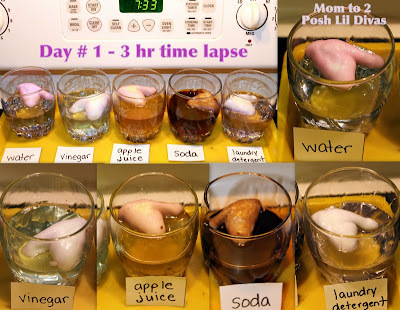 Day 3 - Vinegar is definitely the fastest solvent out of those we tested. Apple juice is causing some dissolving as well at this point. After 4 days we ended our experiment. I carefully took the Peeps out of each cup and photographed what was left of them (see below). You can see that the Peep in vinegar pretty much dissolved, there was very little left at this point. The Peep in water still had a purple tint and was pretty large (even the eyes were still there!). Apple juice caused some minor dissolving and color loss. Soda caused a brown tint but the Peep itself was very rubbery feeling and still rather large (yuck!). I found the laundry detergent to be the most interesting. It took away all the purple color - the Peep was white, but it still had the best shape and size of all the Peeps of an original one. It was also very rubbery feeling. 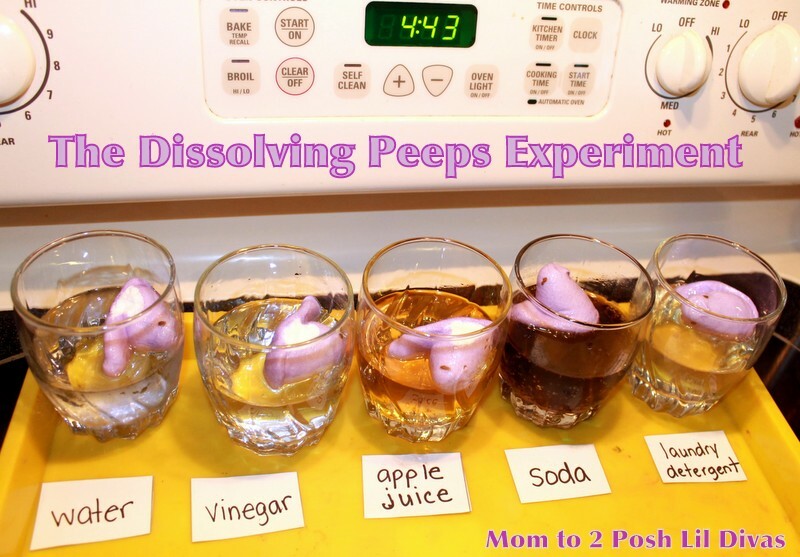 Will you try the Dissolving Peeps Experiment? What will you choose as your solvents? Please come back and share your results with me if you do the experiment. I would love to see the results of different solvents used. How interesting. I have been loving watching your experiments. I bought some Peeps so we can try a few. I wonder if the bunnies would dissolve faster since they are thinner. I wonder! These chicks were pretty resilient. That's a very interesting experiment. The question is would you still eat them? I haven't eaten peeps since I was little. My mother kept buying them to put in my Easter Basket, and they kept sitting there every year. Finally, after I got too big for the Easter Basket is when she finally stopped buying them for me. YUCK!!! Nothing will make me not love peeps but I am excited to do these experiments. What a great idea. haha, I feel a bit bad torturing these poor Peeps but we have had a lot of fun with it! It's all in the name of science, discovery & explorations! The "Peep Experiments" are great. I'm going to try them out with first my sons and then the classroom. have fun with it & be sure to share what you do! That is insane! Thanks for sharing, really interesting to see this one! However Sugar dissolved in water- the Peep- Not so much! 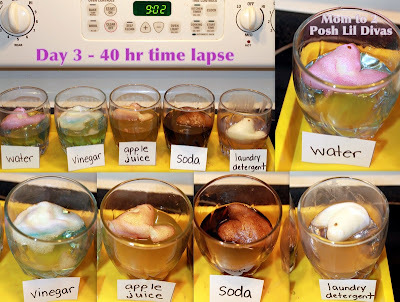 I am planning on a Waster Unit next week in my Preschool classroom and this sounds like an interesting experiment. Thanks for sharing!! Wow, what a FANTASTIC experiment. I want to try this with my daughter. I have been loving your experiments with Peps and Chicks! Well that shows me that the vinegar is def a fat burner! I think peeps are more sugar than fat. I don't think we'd ever be able to get the experiment done...my boys would eat the peeps! Looks like so much fun, though, so I might try! I started this experiment in my 3rd grade classroom this morning. Instead of apple juice I chose liquid starch and vegetable oil. I'm excited to see the results as well as my students. hope you had some grossly interesting results! I finally had to throw them out yesterday afternoon after the students left. The peep in water molded, the peep in coke and vinegar became slimy, but still resembled the original peep shape. Yikes! Oh, and no change in the peeps that sat in liquid starch or vegetable oil. Now, I can honestly tell my mother PEEPS are not just pure sugar. Thank goodness I never liked them! just wanted to share that I did this experiment at school with my kindergarten! they loved it! we used water, coke, orange juice, vinegar, vegetable oil, and kitchen cleaner similiar to 409 with bleach! i used the bunny peeps so they were not as thick. after 4 days, the vinegar had completely dissolved the peep! the vegetable oil showed no changes at all! the sugar was still on it even and it was just hard like a stale peep. coke was gross! lol! thanks so much for sharing! it was a great inquiry lesson the week before spring break to keep their attention!!! So glad you all had fun with it! Next year I will definitely go for the dissolving bunnies to be able to see changes faster! Wasn't it gross and cool all at the same time? That's what my girls loved about it! Did this w/my 1st grade son & his friend. They chose lemon juice, vinegar and ginger ale. The vinegar changed in texture/size the most, lemon juice was 2nd, ginger ale the least. 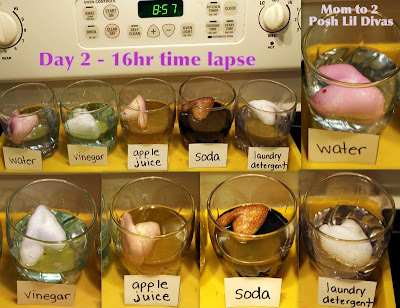 Much more interesting would be to see if the Peep dissolved in hydrochloric (stomach) acid. If that doesn't work, then I'd say, "No more Peeps!" those eyes were resilient! Thanks for sharing. My detergent is very mild because my youngest has eczema so it's not harsh - maybe that's why we got the result we did? I did a sort of similar experiment which started one cold day when we noticed (on the way to school) that the road had been gritted with rock salt. I explained why and when we got home we put three small tubs of water, one plain, one with salt and one with sugar, in the freezer and checked them every hour. I remember watching a "Chopped" episode where the contestants had to make a meal, and peeps were one of the ingredients the contestants had to use. If I remember correctly peeps were dissolved into a sauce on the stove using ingredients such as a white cooking wine. Don't care what happens to the Peeps- I love them! 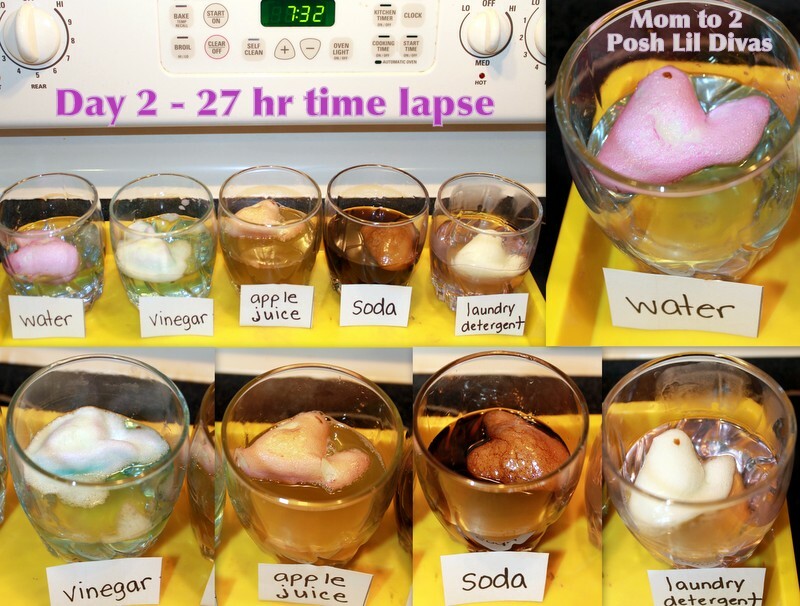 I believe this was a good experiment to show why we need more vinegar in our diets. It helps to break down the yucky in our intestines. What does that actually teach kids? Are we trying to show kids about how chemicals can change states of matter? I do not see what the learning objective is here. you can talk about how chemicals (the solvents) change states of matter (the peeps). To be honest, we did it for fun to freely experiment so I didn't focus too much on the explanations as my girls were 4 & 5 years old at the time. Going to try this with my 5th grade science classes. One suggestion the students made was to use hot sauce! We are excited to try the experiment. I did this today with my high school seniors... and we will only have 24 hours but we saw immediate changes. We used orange juice, lemon juice, vinegar, coke, laundry detergent, amd water with baking soda. 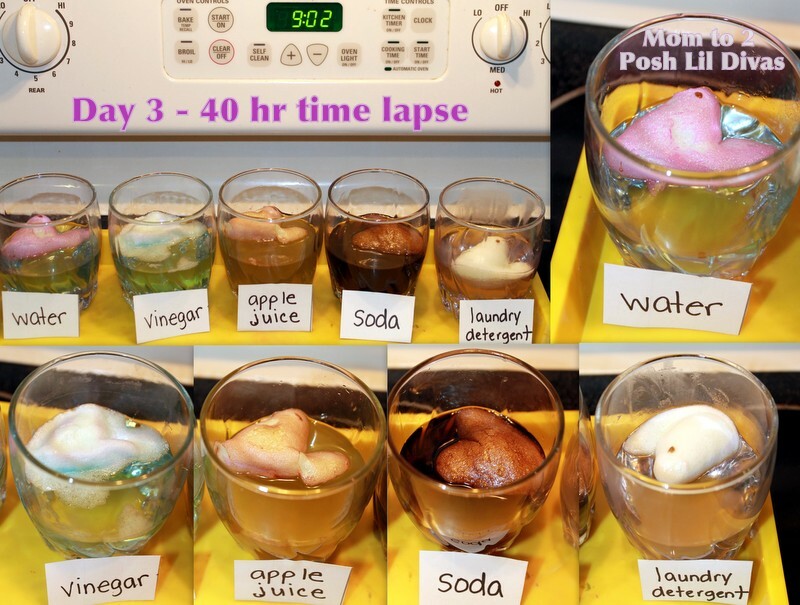 This is really fun and the kids are all guessing what will dissolve it! Does anybody put their Peeps in hot chocolate? Tried this at home with my 4 year old daughter. We used lemon juice instead of apple juice and didn't see much of a difference. The biggest difference was the laundry detergent. We used Tide and there was hardly anything left! It shrunk it down to almost nothing. Can you use marshmallow in place of chicks? I think this would be great for a 1st grade science project, especially since Easter candy is out already!! Have you ever put one in the microwave?? VERY cool!! Yes, that's how I eat them every year. I'm doing this at school for our Science Fair; however I'm having a very difficult time coming up with a hypothesis. Any help would be greatly appreciated. How much liquid did you put in each cup? You should teach them about the scientific reasoning of why this happens. The reason it's vinegar is because it's CH3COOH, and since it's an acid it will dissociate into H+ ions. These H+ ions will work at breaking apart the benzene ring of glucose and creating new strong hydrogen bonds. Soda and apple juice are both acidic, but not as much as the weak acid vinegar; However apple juice is more acidic than soda due to the citric acid present. Then you have water, which is perfectly content not dealing with the massive glucose molecules, therefore not having it dissolve fast because the bonds in H2O are stronger. 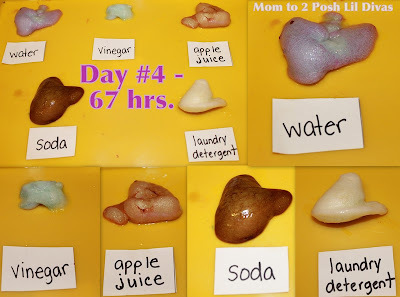 Laundry detergent would work effectively also due to its basic nature, creating OH- ions that would work at taking off the H+ ions hanging off of sugar. The vinegar won because it was a stronger in acidity than the laundry detergent was in basicity. There is your somewhat watered down chemistry lesson. In all the peep dissolving experiments I've seen, I have yet to see someone use yeast. It will disappear peeps into nothingness in about 6 days.